RIX, Julian Walbridge (1850-1903) was an American landscape artist, born in Vermont in 1850. He moved with his family to San Francisco as a small child. When his mother died four years later, his father sent him back East to live with relatives. In 1868 he returned to San Francisco where he clerked in his father’s law office for a short time and then began working for a house and sign painter. While painting signs, young Julian began painting landscapes which drew the positive attention of local art critics. He may have received encouragement from Albert Bierstadt, whose brother Edward was married to Rix’s aunt. Despite his father’s disapproval of his art career, Julian spent a year painting in New England and New York before returning to San Francisco to study briefly at the School of Design under Virgil Williams and Thomas Hill. He was invited to join the Bohemian Club in 1876 when he was 26 years of age and he became close friends with bohemian artists Amédée Joullin (1862–1917), Jules Tavernier (1844–1899), Strong, Brookes, and Yelland. He followed Tavernier to the artist colony in Monterey and later they shared a studio in San Francisco in 1879. Rix was popular with the bohemians and was nicknamed “Adonis” (AskArt) for his imposing size and blond good looks. During the 1870s, he became known for paintings of Pacific Coast mountains, including Oregon’s Mount Hood, and California subjects including the Sacramento River, the Trinity Alps, Clear Lake, and Mount Shasta. After a failed romance with sketching partner Nellie Hopps, Rix became a lifelong bachelor. When the financial slump of the 1880 hit the art world, rather than follow the demise of his friend Tavernier by alcoholism, Rix decided to eschew the bohemian lifestyle, giving up his habits of smoking and drinking. His appeals to his family for financial help were denied, but fortunately an art patron befriended Rix at this crucial time in his life. Wealthy banker, art collector, and scion of a silk fortune John Ryle visited San Francisco and became his lifelong patron. Ryle invited Rix to stay at his country estate in New Jersey while he got his art career on steady footing, and Rix established a studio in New York City. There he enjoyed commercial success with his watercolor and oil paintings, exhibiting at the National Academy of Design. Despite his exodus from the West Coast, Rix remained interested in the San Francisco art community; in 1883, he sent two hundred paintings there for a solo exhibition. He continued to send paintings to San Francisco for exhibition with the San Francisco Art Association and he regularly visited California for more source material. In 1885 he created a series of forest drawings to illustrate an article in Harper’s New Monthly Magazine. 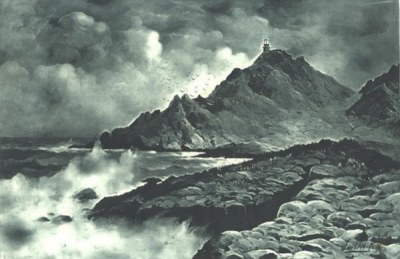 In 1888, he was one of the artists who contributed images for Picturesque California, the Rocky Mountains and the Pacific Slope, a journal of writings and illustrations edited by naturalist John Muir that represented the natural wonders and spectacular scenery of the thirty-first state. In 1889 Rix took a sketching trip to England, Germany, and the Netherlands. In the 1890s, his work became more influenced by the French Barbizon School and impressionism. After a visit to San Francisco in 1901 as his health was fading, Rix visted with bohemian friends including William Keith, and soon died in his New York studio after an emergency kidney surgery at age 53. Estranged from his family, Rix left his estate in the hands of his friend and patron John Ryle. Julian Rix was a god parent of Ryle’s daughter and he is buried in the Ryle's family plot. The Society of California Pioneers collection has three Julian Rix landscape paintings. This page was last edited on 26 December 2016, at 17:44.